Once written off as a sexting app for teens, the parent company of ephemeral messaging service Snapchat, Snap, just revealed its filings with the US Securities and Exchange commission to become a public company. Spectacles, the Bluetooth video-taking glasses that Snap launched in September, haven’t done much other than generate buzz: “The launch of Spectacles, which has not generated significant revenue for us,” the company said in its filings. “We have limited manufacturing experience,” it added. Although Snapchat exploded in popularity over the first few years of its existence, it seems that growth has stalled somewhat in recent quarters. It had 161 million daily active users in December, up from 154 million the quarter before, only a 4% quarter-over-quarter increase. 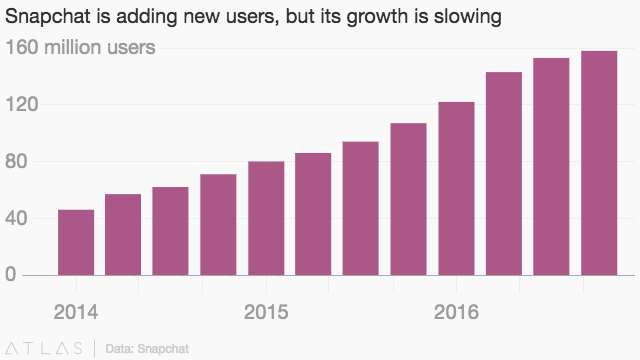 Snapchat’s user growth—considering at this point Snap is still almost entirely Snapchat—has started to taper off. Especially in the US, its largest market. 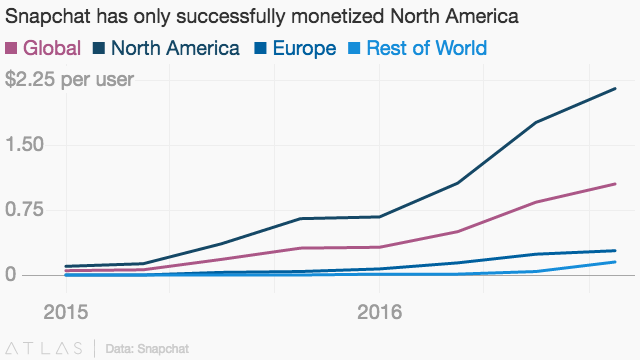 Right now, Snap’s highest average revenue per user is in North America, its home base. And although the company is currently losing a lot of money, it also figured out how bring in a lot more revenue in 2016 than 2015. If this trend continues, Snap might be able to do something Twitter has struggled to as a public company: Turn a profit. 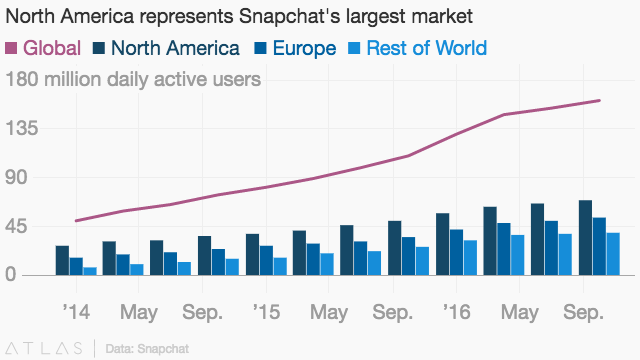 That’s assuming Snapchat continues to bring in new users. The other problem is that Snap’s business is expensive to run: Before any compensation, research and development, or administrative fees, it cost Snap $451 million to bring in $404 million in revenue. As The Information pointed out yesterday, one of Snap’s biggest costs is going to be paying for the servers that run its software. We face significant competition in almost every aspect of our business both domestically and internationally. This includes larger, more established companies such as Apple, Facebook (including Instagram and WhatsApp), Google (including YouTube), Twitter, Kakao, LINE, Naver (including Snow), and Tencent, which provide their users with a variety of products, services, content, and online advertising offerings, and smaller companies that offer products and services that may compete with specific Snapchat features. For example, Instagram, a subsidiary of Facebook, recently introduced a “stories” feature that largely mimics our Stories feature and may be directly competitive. Snap will spend the next few weeks on a “road show,” i.e. pitching itself to potential investors ahead of the actual public-offering day. Snap will also enter its ”quiet period,” during which it can’t publicly comment on its business, until the SEC accepts the company’s filing documents. 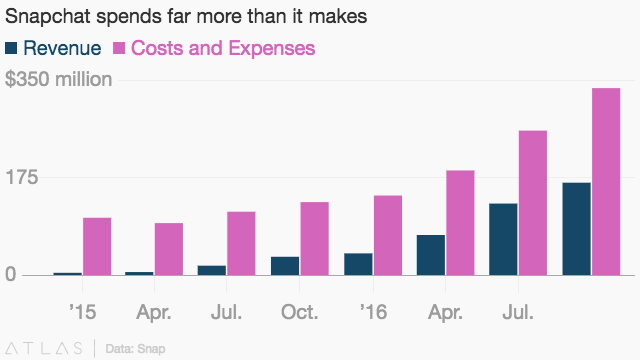 Long-term, Snap will need to sort out its cost of doing business, and how it generates revenue outside the US. It also needs to ramp up growth again. In its filing, Snap said that it currently devotes much of its development attention to Apple’s iOS mobile operating system, as “the majority of our user engagement is on smartphones with iOS operating systems.” Given that Android is the most popular operating system in the world, especially outside of the US, there’s a lot of room for growth, assuming Snap stops focusing so much on iOS development. There are other concerns for the future. Google, as well as being a competitor, is a major service provider for Snap—the company uses Google Cloud services “for the vast majority of our computing, storage, bandwidth, and other services.” If Google decides to start charging more, or cut Snap off, the company will need to find a new provider, or increase its already high cost of doing business. On top of that, Snap acknowledges that even with its recent foray into hardware, the overwhelming majority of its revenue—98% and 96% for 2015 and 2016 respectively—comes from advertising on Snapchat. If it can’t keep growing its user base, or find new advertisers to sign on, the company will struggle unless it can start to diversify its revenue streams (something that Twitter has also struggled to do). That being said, Facebook and Google were in a similar boat when filing their IPOs, and those companies have turned out just fine. In another disclosure reminiscent of Twitter, Snap notes that it has “incurred operating losses in the past, [expects] to incur operating losses in the future, and may never achieve or maintain profitability.” That’s relatively standard language for an IPO at a startup of this sort, but still should be a concern for investors. 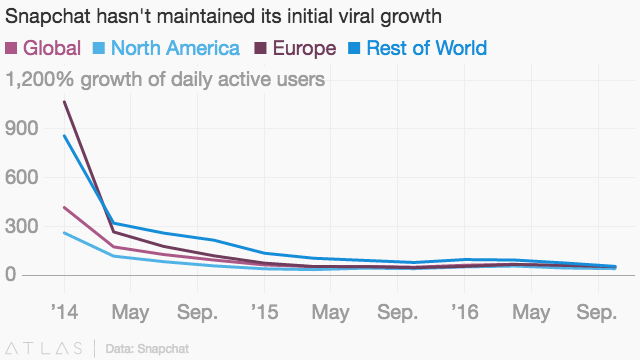 Snap has a lot of factors it needs to contend with—among them Facebook’s ability to launch any service Snap does as soon as Snap does, and to a larger audience—but Snapchat’s stickiness—the fact that so many people check it so many times a day, and for so long—could be a major boon. Advertisers will know that Snapchat is exceedingly popular with younger users. If it can translate that success into older, less cool generations (as Spiegel tried to explain to parents three years ago), then there may be success in Snap’s future. After all, that’s how Facebook ultimately succeeded: by convincing literally everyone and their mother to join. Whether the same proves to be true for Snap, a company whose main product involves quick-dissolve branded selfies, remains to be seen.